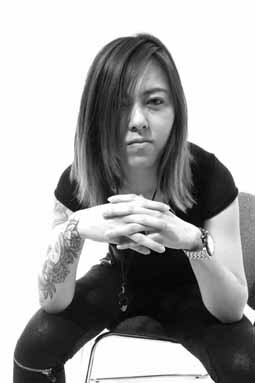 Melissa Kheng, MFA Fashion Design, was born and raised in Singapore. Her thesis menswear collection is inspired by the unabashed masculinity of the Japanese subculture Bosozoku, and utilitarian elements of traditional fishermen. Both concepts are similar in being part of a group that gave life meaning and solidarity with others. Waxed cotton coats and jackets, oversized pocket pants, layered panels, and laser cut graphic pieces are combined with classic street wear shapes. The collection: (1) Laser cut vest with white pants, (2) Contrast trimmed coat with cotton pants, (3) Contrast trimmed jacket, top and white cotton pants, (4) White jersey tee with contrast laser cut details white pants (5) Contrast jacket with oversized pockets and cotton pants (6) Contrast jacket with laser cut sleeves, cotton pants and top.